The U.S. Department of State offers excellent cultural learning opportunities through a variety of student programs and internships. 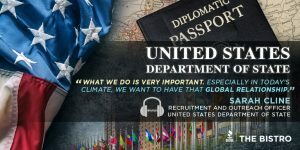 Sarah Cline, Recruitment and Outreach Officer for the U.S. Department of State joins us on The Bistro to share more about them- and exactly how you can get involved! Discover the benefits of diversity, inclusion, and engagement to your organization and employees with clinical psychologist Dr. Vanessa Weaver. 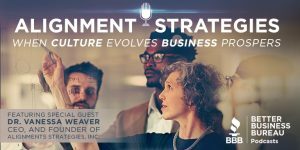 Dr. Weaver is the CEO and Founder of @AllignmentStrategies and @ditvmedia, one of the country’s first independent organizations to focus on diversity as a business driver. Whether you’re still in school or just landed your first job, you can navigate the ins and outs of managing your money for a bright financial future! 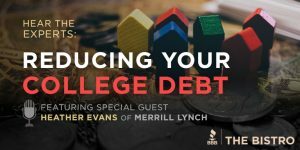 On this podcast discussion, Heather Evans, a wealth management advisor with @Merrill Lynch, shares helpful tips on paying off your college debt. Sound. It’s one of the 5 senses we don’t always pay close attention to in the business, but we should! 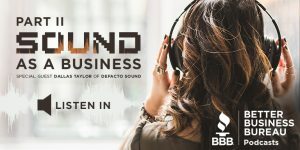 Dallas Taylor, the host of the popular @20korg podcast, is back on the Better Business>Better Series podcast to explain how businesses can carefully design a quality sound experience to attract customers and set themselves apart from the competition.